Before we start filling anything, we need to know the colors of our image. We can utilize HTML5 imageData object to describe our image as an array of pixel data or more specifically a CanvasPixelArray object. 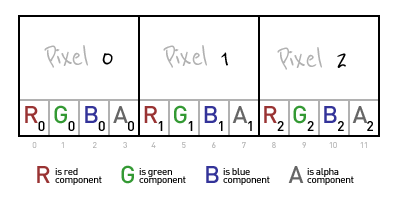 Each pixel is in the form: [R, G, B, A] where R is the red component, G is green component, B is the blue component, and A is the alpha. The image data for an image consisting of one red pixel is described as [255, 0, 0, 255]. The imageData for a four pixel image (red, black, white, purple) is described as [255,0,0,255, 0,0,0,255, 255,255,255,255, 203,53,148,255]. The example image we will use throughout this article is 3 pixels wide and 5 pixels high. It consists of 15 pixels, 13 white [255,255,255,255] and 2 black[0,0,0,255]. The black pixels are in positions 3 and 7. Our objective is to fill of all similarly colored pixels connected to the starting pixel with a new fill color. 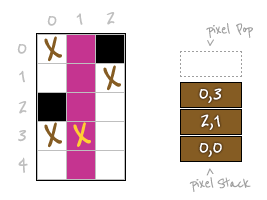 In our example the starting pixel is white and the fill color is Watermelon Duck purple. 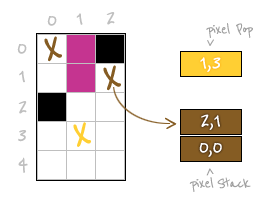 First push the starting pixel's x and y coordinate into an array called pixelStack. Let's start at pixel location (1,3). Next we create a while loop which will pop the most recently saved pixel location in pixelStack. In the case of our example, we pop the only coordinate (1,3) and assign those values to the variables x and y respectively. 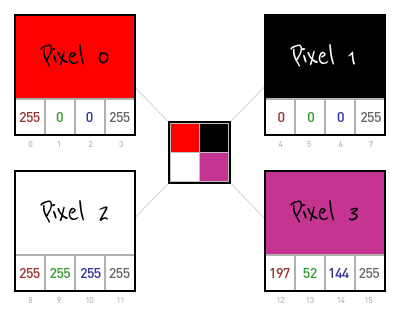 We travel upward pixel by pixel until we find the image boundary or a pixel that does not match the fill color. We use another while loop and the function matchStartColor which returns true if the color matches the starting color. After travelling up 3 pixels we encounter the edge of the image. We know this because y becomes -1 the condition y-- >= 0 fails. Since we have gone too far up, we increment y and update the variable pixelPos. 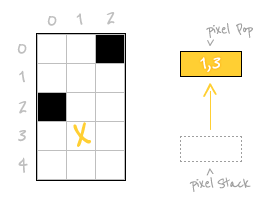 Instead of just incrementing the pixelPos by one, we increment by the canvas width times 4. We initalize a couple of new variables reachLeft and reachRight to false. These will be used to manage additions to our pixel stack. We will see how soon. We create another while loop, this time travelling downward. 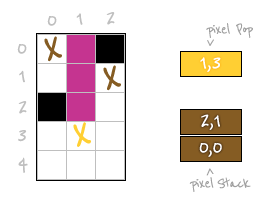 Unlike how we went up blindly, the way down will involve adding new pixels to the stack and coloring pixels. Let's start by coloring our first pixel at (1,0) with the fill color purple. 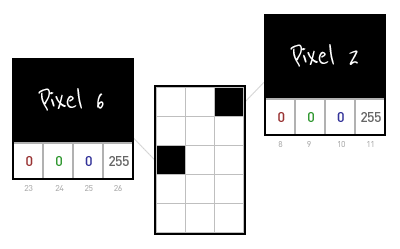 After filling the pixel at (1,0) we must now determine if its neighbors to the left and right need filling too. First let's investigate the pixel to the left. 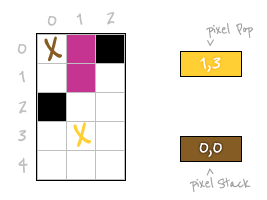 Ignoring any pixels with x position less than zero we check if the color matches the start color. 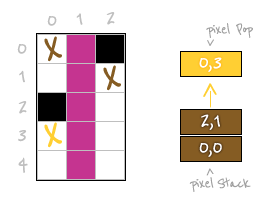 In our example the pixel to the left is white just like our start pixel, so we add it to the stack to handle later. We also set the boolean reachLeft to true. This will prevent us adding pixels that will eventually handled by the downward march of the pixel we just added. Now we look to the right. The pixel on the right is black which does not match the starting pixel so we do not add it to the stack. We continue the march downward. The pixel below matches our starting pixel so we color it purple. We look to the left of our new purple pixel and find it matches, but reachLeft is true so we don't add it to the stack. 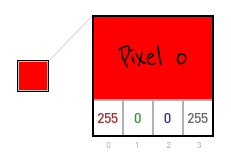 The right pixel also matches but its variable reachRight is false so we do add it to the stack. Color the next pixel. Look to the left, no match this time so we change reachLeft to false. Looking to the right matches but reachRight is true so we do nothing. Color the next pixel. It happens to be the starting pixel but other than for reasons of nostalgia it's not significant. We look to the left and the color matches. Since we changed reachLeft to false last time, we add it to the stack. The right side matches too, but its boolean reachRight is true so we don't add it. Color the pixel below. The booleans reachLeft and reachRight to the right and left are true so we don't add them to the stack. We have reached the bottom of the image thus are done with the column of our starting pixel. The first column has been filled however they are still pixels in the stack which means there are more columns to fill. 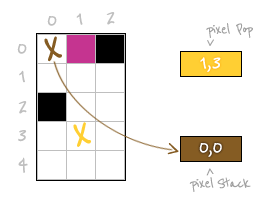 Pop the next pixel from the stack which is the pixel (0,3). We continue the process until the pixel stack is empty and there are no more columns to fill. 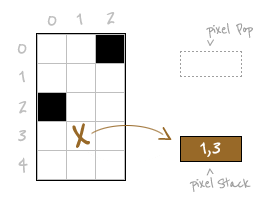 Eight pixels later we have filled all the matching pixels in our example image. Although our example image was small the process is the same for larger images. Firefox does not support pixel manipulation locally. It will work when hosted on a site, but if you try to test locally you will what Firebug describes as 'Security error" code: "1000'. The best explanation for this error was described by skarabaeus here.